There’s a lesson to be learned from flowers, and even I did not realize it until I saw the excerpt from above. Whoever said this, I can only imagine, must be in a blissful state of contentment. In my case though, I agree and that it shouldn’t only begin to happen when we can have anything we want. 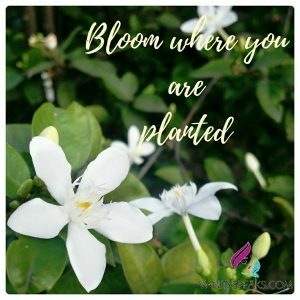 We should always bloom in every small achievement we get. This is regardless if we wake up on the wrong side of the bed. The fact that we woke up at all is a glory in itself, therefore we should bloom. While we don’t get to choose where we are planted. We can always choose whether to bloom or not.